Bald Head is the southernmost part of a complex of sandy islands and marshland at the mouth of the Cape Fear River known as Smith Island. Fixing the precise location of Bald Head is difficult. Some North Carolinians apply the name to an entire island, while others use it to refer to only a small part of that island. Those who have studied the area and its history generally use the name Bald Head Island to refer to the part of the Smith Island complex that extends from Cape Fear on the east to the Cape Fear River on the west, with the Atlantic Ocean stretching away to the south. They reserve the name Bald Head for the area near the river on which Bald Head Lighthouse is located. Initially, the island complex was shown on maps as Cape Island, or Cape Fear Island, and even earlier it was said to have been known as Cedar Island. In time, all of the land in the area located east of the Cape Fear River was claimed by Landgrave Thomas Smith, a South Carolina merchant who perfected his title in 1713 with a grant from the North Carolina authorities. Within a few years cartographers were showing the name on their maps as Landgrave Thomas Smith's Island, leading in time to the current name of Smith Island. Bald Head itself was a large sand hill on the southwest part of the island from which Cape Fear River pilots could get an early view of oceangoing vessels heading toward the mouth of the river. It appeared as "Barren Head" on the 1733 Mosely map, but by the time the Collet map was published in 1770 it was shown as Bald Head. By then, maritime traffic had become so heavy that there was a clamor to build North Carolina's first lighthouse at Bald Head. In 1784 the General Assembly levied a special six-pence-per-ton duty on all vessels entering the Cape Fear River, with the proceeds to go toward building a lighthouse. Five years later, before the lighthouse was completed, the U.S. government took over responsibility for the "establishment and support of light-houses, beacons, buoys and public piers," with the expenses to come from the federal treasury. 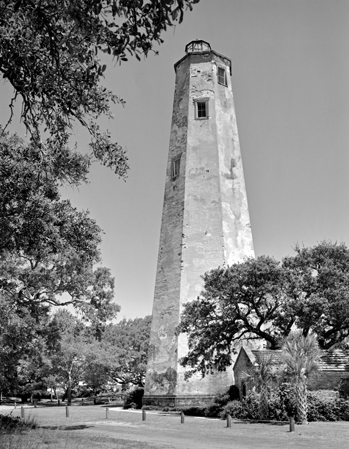 The lighthouse at Bald Head, begun by the state and finished by the federal government, was first lighted in 1795, but the structure was built so close to the Cape Fear River that it was threatened by erosion and had to be abandoned 15 years later. A second Bald Head Lighthouse was built in 1818, this time well back from the water; it remains the oldest standing lighthouse in North Carolina. The first Cape Fear Lifesaving Station was built on the East Beach near the lighthouse in 1882, and for the next half-century crewmen from the isolated shore station participated in many rescues of shipwrecked mariners. Efforts to develop Bald Head Island as a tourist destination began as early as 1916, when Thomas Frank Boyd paid $45,000 for the entire Smith Island complex, consisting of Bald Head Island, Middle Island, Bluff Island, and assorted patches of migratory marshland. Calling his development Palmetto Island, Boyd built a long pier (to accommodate river steamers) and a combination pavilion and hotel. He subsequently lost this entire property for nonpayment of taxes during the Depression. In 1938 title to the complex was acquired by Frank O. Sherrill, who retained ownership for three decades and periodically talked of development plans. His 1960 plan to build a resort city for 60,000 people-in the process dredging up virtually all of the Smith Island marshland-never got past the talking stage, although there was considerable public uproar over the prospect of the destruction of Bald Head's unique natural resources. When a newly formed company called Carolina Cape Fear Corporation announced in 1970 that it had acquired the Sherrill property for development purposes, spokesman William R. Henderson was careful to emphasize that it planned to proceed in a "very responsible manner," with special emphasis on protecting the ecology and environment of the island. The project failed, but two subsequent owners-first Walter R. Davis and then the family of George P. Mitchell-proceeded with the carefully planned development of Smith Island. The owners have worked closely with the state of North Carolina, federal agencies, and environmental groups to protect and preserve most of Smith Island's approximately 17,000 acres-habitat for an amazing number of plant and animal species, many of them threatened or endangered.